Normally here at Oregon.com we don’t write about restaurants unless they are an iconic part of the Oregon experience. 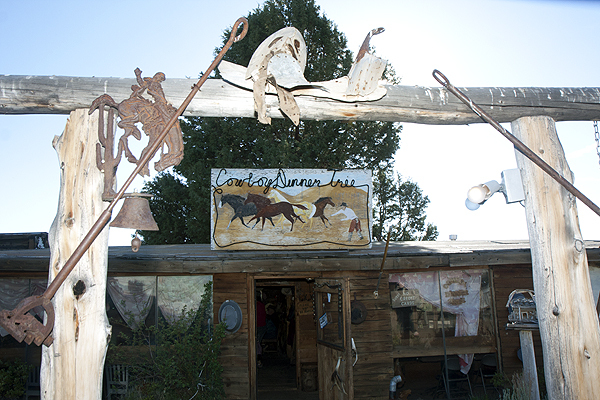 While many people might not know about Cowboy Dinner Tree, anyone who lives in Central Oregon, or even Eastern Oregon for that matter, knows about the place where you get an authentic cowboy dinner, in an authentic cowboy setting. The old story about Cowboy Dinner Tree is that cattlemen used to stop on the way driving their herds from Paisley, Summer Lake and Silver Lake to meadows in Sycan Marsh. On the way, they would stop at a placed called “Dinner Tree” and it was considered the halfway point of the journey. That is how the restaurant was born. Instead of a chuck wagon, however, now there are very rustic shacks and a storefront that houses the restaurant. Cowboy Dinner Tree is a destination, as there isn’t a whole lot around it, and when you do arrive, you feel like you entered the set of a Clint Eastwood spaghetti western. The only thing missing is the sound of your spurs as you walk to the entrance. If you are the “white napkin, chef explaining the meal at the table” type of person, you might want to reconsider Cowboy Dinner Tree, as this is eating in what I call the “Old West” style. Big, rustic and so good you will wish you brought pants with elastic in the waistband. To enjoy a dinner at this restaurant, you will need to call and make a reservation – they don’t accept walk-in customers. Also, the don’t take credit cards, cash only. Rumor has it the restaurant only got power a few years ago, and each night the dinner is made fresh. You have to call ahead, and let them know what you want to eat. You have two choices, chicken or beef. Period. We heard about the restaurant from some people in LaPine, and even though the restaurant was an hour away, we were told it would be worth the trouble. The drive from Bend is a bit longer, but the desert scenery is nice and it’s a fairly easy drive. Both my wife and I selected the beef, and when we arrived we weren’t disappointed. The first part of the meal is a family-style affair, with a large plate of old fashion sweet yeast rolls on a cast iron plate put down on the table. When the salad arrives it’s a big bowl and the homemade salad dressing is amazing. Again, two choices, honey mustard or ranch, and they both are delicious. When the soup arrives, you realize that by the time you get to the main course, you will be full. Experienced diners will hold off on the appetizers and wait for the main meal, but I am getting ahead of myself. I am not a huge fan of corn chowder. But the corn chowder I had at Cowboy Dinner Tree changed my opinion of the soup and the vegetable. After two bowls, I was a believer in the corn chowder. Options are not on the menu at Cowboy Dinner Tree, it is a place where they do a few things, and they do it utterly perfect. Here is where we talk about the main course. Quite honestly, when the plates were set on the table, I felt like I was 5-years-old again, looking at a baked potato almost the size of a football, and a steak that looked more like a roast. What was sitting in front of me was 30 ounces of the most perfectly cooked steak I have ever eaten. Even now, weeks after the meal, I can still taste that steak, rolls and potato. It was such a good meal. There was no way to finish it all, and we were given plastic sacks to put our leftovers in, and the table next to us go what was left of the rolls after the meal, as we ate at the end of dinner service. We ended up eating the leftovers of the meal for two days – for both lunch and dinner. And what about those people who ordered chicken instead of steak? They receive a whole roasted chicken. You read that right, the entire chicken like you would feed a family of four. If you find yourself in Central Oregon, want an adventure, and are hungry, Cowboy Dinner Tree is the place to go. About Cowboy Dinner Tree: A restaurant near Silver Lake, Oregon that offers one of the best, rustic, cowboy dinners this side of the old west. What to bring: Cash, as they don’t take any type of debit or credit cards. Unless you are a competitive eater, you will have food left over. Since you are going to be about an hour from the larger destination cities in the area, bringing a cooler and even containers for your left overs would be helpful. They will give you a large clear plastic bags when you have leftovers, but bringing your own with a cooler would seem more convenient. Tip: If you are planning a camping trip in Central or Eastern Oregon, this is a great place to stop, get a great dinner before heading into the wilderness, and then having enough leftovers for sandwiches on your trip. Aside from that, make a decision that you are going to enjoy the appetizers (which are basically a full meal before the main course arrives), and then decide to take the main course home. Either way, when you get this much food, a strategy is required. Also, during vacation times they can get busy, so make sure to reserve your seat before your trip to make sure you get a spot. Season: The restaurant is open year-round, winter hours are Friday through Sunday, in the summer they add Thursday nights. Getting there: Take Highway 31 to Silver Lake, then turn on East Bay Road 4.5 miles south of Silver Lake. For a map and specific directions, visit www.cowboydinnertree.net.